This is a video of a three-year old who memorized and recites the poem Litany by Billy Collins. It's amazing because he seems to understand the poem. He's not just saying words. What a nice way to start your day! I woke up at 4 and went back to sleep. I'm either going to work out at 8 or ride my bike to work. I checked weatherundergound, though, and the humidity is 94%. Lovely. 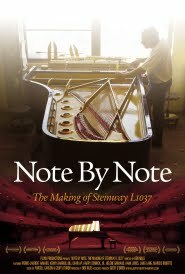 We watched a great documentary the other night called Note by Note: The Making of Steinway L1037. It was fascinating. I really could not have imagined the art that goes into making a piano. Much of the work is done by feel and by eye...not machine. Such interesting people that do this for their life's work. We've seen such awful movies this summer so this one was a delight. It reminded me of an article I read a few years ago about a woman who helps customers select their piano. Apparently this is complicated when one is spending more than a hundred thousand dollars. The customer comes in, talks with her for a while, she writes a number on a piece of paper. Eventually this is the piano they choose. My summary probably doesn't make it seem quite as magical as it was in the article but it was magical. It takes a year to build a Steinway piano so they're like babies complete with individual personalities. Somehow I had forgotten that Regis and Peter go back to school next week. There was a time when college students started school way past the time that public school students started. When did that change? Peter is having a snaggle with the community college he attends. You know the one I mean. He's taking his last two classes to finish his degree and they claim they don't have his high school transcript. He's gone there for two years and he's faxed it twice. What the hell. Regis went to pick up his books yesterday since they told him they were all in and ready. He got there and one was not there which means another trip but this time in a mob of students. He was not happy. He also got an email saying that parking would be tough and he may have to park on the street. For this he pays a parking fee? Frustration all around. Regis bought our dog some little doggy dixie cups at the store the other day. It looks like ice cream. He's really an old dog and we indulge him. Some of us more than others. So, I get the dog his little doggy ice cream cup, dump it out in a dish and he proceeds to lick it into submission. When it's almost gone, he turns his head three inches to the right and ralphs up a slimy mess right on my new rug. I had a hissy fit about dogs and rugs and poop and barf and pee. Peter was there to clean it up but my stomach started churning which did not help my disposition at all. I had to get out the Spotbot to do the rest of the job. Ugh. Well, there you go. Be happy today. Life is short and unpredictable. LOVED THE VIDEO OF THREE YEAR OLD FUTURE POET LAUREATE. REMINDS ME OF ME AT THIRTY.